If your website looks outdated then it’s probably time to give it a new look, but which is better, a refresh or a redesign? A full website redesign means changing virtually all major aspects, while a refresh only involves modifications with some elements onsite while leaving the rest intact. But which one is better? A website refresh can be implemented in specific areas of your website, and it won’t affect the site’s functionality so you can make changes here and there without any downtime. It’s also easier to implement than a redesign and doesn’t take a lot of time. You can think of a refresh as similar to applying a coat of paint on your car: your car looks different now, but inside the components are still the same. A website redesign on the other hand, is more comprehensive and instead of just a paint job it involves replacement of the doors, engine, suspension and other parts. A redesign goes much deeper than just a visual upgrade as it includes changes to the content management system, replacing the theme and more. In many cases a redesign is the best option, if only because the cost has gone down significantly the past few years. In the past, a complete overhaul was just too expensive, but now the difference between the two isn’t that great. Second, a highly trained team of website redesign experts can do an overhaul with very little downtime. But apart from the cost, a redesign is the most practical option if you don’t have the time or resources to continuously refresh, test and analyze your site. Furthermore, redesign is the most effective way to fix problems with an old CMS or an outdated layout. In addition, redesign could give your website a fresh new look that will entice people to come and stay. This could lead to increased hits and eventually more profits, so it can be a good investment. The bottom line is this: you should consider a full website redesign if the present CMS is no longer working or you cannot change certain elements without tinkering with the CSS, ASP, PHP, or HTML files. You’re also better off redesigning the website if customers are complaining about the site’s design and the bounce rates are going up. When the situation reaches this level, then a simple refresh won’t do as a more drastic overhaul is necessary. The good news is that redesigning a website doesn’t take too much time nowadays, and you can find a lot of companies dedicated to this task. And since the competition is there, expect the cost to be very much within reach. 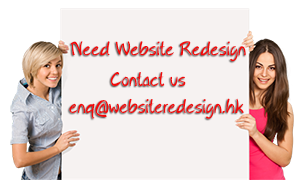 For details of your website redesign project, please contact us now.